I won’t go into the messy details, but I had a major sewer line issue recently at my home (our line collapsed), causing me to have dig my yard to shreds to fully fix the problem (side note: If you have Orangeburg pipe in the ground, it’s only a matter of time before it fails you, too). I’m a computer guy, not a plumbing contractor, and during the whole process of dealing with permits and getting things all fixed up so I could flush my toilets again, I learned a lot that supported a lot of reason why we do the things the way we do here at Weston, and how we can always get better. You probably never thought you’d read about household water waste and IT in the same story, but read on and you will. There were three major things that I learned during the whole process of replacing my sewer line that I think could be applicable to any business out there, let alone how we do things. Document, Document, Document: My sewer line replacement and re-route wasn’t a standard job. Because of how our neighborhood was built, I needed a special exemption to do the work I needed to do – an exemption I had received months ago as I had already begun plans to replace the line (we were saving up to do so). The problem? I could not find the exemption documentation that I received anywhere. “No problem,” I thought. “The permit office should have it on file.” Nope. They had no idea what I was talking about, requiring me to get the exemption reapproved, causing me to have to spend an unnecessary amount of time to fight to get something approved that I already had approval from somebody else (who was nowhere to be found). How is this applicable? We’re the first to admit that we could be better at documentation (we’re pretty good at it, but we have high-standards of ourselves), but we know the value of it. We also try to have the attitude on our service team to always remember that “You’re not going to be the last person to read these notes, nor the last person to work on this system, so document your ticket notes accordingly.” If something were to happen to the original consultant that worked on a system, somebody else should be able to look at the documentation on the ticket to make sure we’re not having to re-invent the process that was followed. If the permit office would have had that note about my property, I could have had the needed permit in a couple hours instead of a couple days. On top of that, when you have a contract with us and we have our maintenance and monitoring agent installed on your computer, we tag your machine in our ticketing when we work on it. By tagging it like that, we are able to run reports to see all the tickets that are attached to a particular machine, so our service techs can easily see if an issue has happened before. When You Schedule Something, Stick To The Schedule: I was fortunate enough during the process that I had a friend of the family who was an excavator who had some time in his schedule. But I also didn’t have a lot of time to mess around. So when anybody involved in this project gave me a schedule, I held them to it so that I could get my water running sooner rather than later. That enabled the process to go fairly smoothly (once the permits were in-place). How is this applicable? Weston does things differently than many IT support companies out there. At some companies, a technician will receive a list of tasks he needs to get done and he runs around doing them as fast as he can, prioritizing tasks himself. Outside of our helpdesk, our techs are generally scheduled out by our dispatchers (who know what’s out there and what should get priority). They know what they are working on at certain times and clients know when to expect people for an on-site visit or remote support session. This allows our clients to not have to schedule their day wondering when we’re going to show up, allowing all parties involved to be as productive with their days as possible. Best To Leave Some Things To The Professionals: When the line first collapsed, I was going to get all my family and friends, bribe them with dinner, and have everybody come over and start digging a trench. Thankfully I had a friend who knew an excavator who was between jobs so we hired him to make sure it was done right. And I’m glad we did. 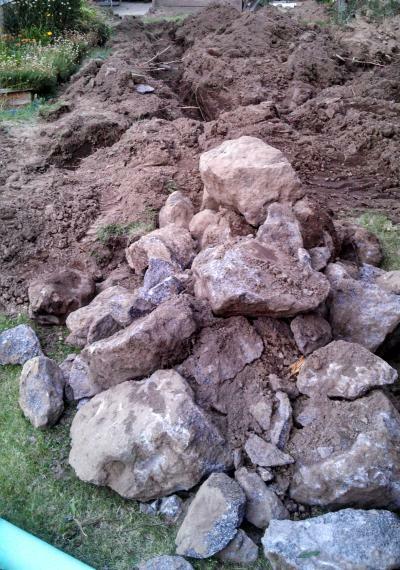 The massive amounts of rocks that had to be carved out of my yard (many that had to be jackhammered out) would never have been able have been removed without powertools. While I might have been able to dig the rocks out, it would have taken me far longer as I didn’t have the tools to do what I needed, nor the knowledge to know that where I was digging was the correct place. On top of that, the excavator had a good relationship with the city inspectors, which allowed him to directly converse with them to keep things on schedule. How is this applicable? We’re as frugal as anybody, but we also know when we need to bring in the professionals. When it comes to your IT, you need to know that as well. If your computers and systems are having issues, taking the wrong steps to fix them (and not having a backup plan if things go south) can be catastrophic to your company, potentially causing a great deal of lost revenue and business. We’ll be the first to admit that sometimes we have to search Google for answers to perplexing issues, but we have the knowledge to be able to separate the junk from the gold in a search result and make it applicable to the situation at hand. We also have the certifications required to be able to call the experts who made many of the software and hardware products you use on a daily basis, and pick their brains to figure out a problem. We have the tools and relationships to make sure things get done right and as quickly as humanly possible, without causing more downtime than necessary. Those were three of the biggest points that I learned during the whole process that I have passed on to the team here as things we can make sure we learn from. As we move beyond our 20 year anniversary and into the next 20, we need to continue to learn every day, and sometimes it takes an unflushable toilet to remind us why we do the things we do. Side note: Send me an email at jortman (at) weston-tech (dot) com if you need an excavator in Central Oregon. I have a good recommendation.